FRYE, HERMAN NORTHROP, university teacher, literary and social critic, essayist, and editor; b. 14 July 1912 in Sherbrooke, Que., third and youngest surviving child of Herman Edward Frye and Catharine (Cassie) Maud M. Howard; m. first 24 Aug. 1937 Helen Gertrude Kemp (d. 4 Aug. 1986) in Toronto; m. secondly there 27 July 1988 Elizabeth Eedy, widow of former mp James Elisha Brown; there were no children; d. there 23 Jan. 1991. Northrop Frye is one of the few 20th-century literary critics in the English-speaking world whose name is likely to last. From the beginning, he wrote with authority and a voice of his own – crisp, witty, aphoristic. (“Good books may instruct, but bad ones are more likely to inspire,” he told a Modern Language Association audience in 1987.) He “is certainly the finest prose writer among modern critics,” said British critic Frank Kermode in the 1980s. “He has the expository force and some of the wit of Shaw.” Frye had no patience with sloth or pretentiousness, especially in the arts or in criticism, where a little knowledge is a dangerous thing. He made his reputation with his first two books, published in 1947 and 1957, to which he eventually added 19 more. The standard bibliographies also list 15 books edited, as well as some 300 essays and book chapters, exclusive of reviews and interviews. Yet such quantity in itself indicates little of the reason for Frye’s eminence. It is the rigour and comprehensiveness of his judgements and critical structures, his ability to go to the heart of an argument and reshape it from within, his gift for clarifying perennial literary and other problems by mapping lines of thought and feeling, his encyclopedic range of exact knowledge. Governing all his formidable intelligence was a passionate commitment to his vocation and to the arts. It is not surprising that Frye was one of the rare critics held in high esteem by writers of the first order around the world. After the publication of Anatomy of criticism in 1957, his influence was enormous, especially in North America. It diminished throughout the 1970s with the growing prominence of other theoretical emphases, different in kind, beginning with deconstruction. Nonetheless, his impact remained strong throughout his lifetime. On his father’s side, Northrop Frye (he always used his second given name, abbreviated to “Norrie” by his friends) was said to have had a Puritan ancestor who emigrated from Britain to New England in the 1630s. His mother’s father, a Methodist clergyman, was intensely proud of his loyalist heritage. Herman Frye and Cassie Howard had two children before Northrop, a son, Eraytus Howard, born in 1899, and a daughter, Vera Victoria, who followed a year and a half later. (A third was stillborn or died at birth.) Herman worked as a clerk for hardware firms in Massachusetts and in Sherbrooke before attempting to establish his own business in 1915. Frye’s brother enlisted during World War I, only to be killed, aged 19, at Amiens, France, in August 1918, some three months before the end of the war. The death cast a pall over his parents. Howard had been an all-round student, outgoing and athletic. As a child, Northrop was conscious that he was different from his idealized older brother: “my mother’s feeling that she had only one son and that I was a second-rate substitute for him ... may have affected me in some ways.” Shy, physically awkward, and short-sighted, he took readily to books. Cassie Frye taught all her children to read when they were young, and Northrop could do so at age three. He had a natural talent for reading, consuming books omnivorously as he grew up, remembering precisely what he read, and thinking about it. He also discovered before long that he had a natural wit, a fine defence for a quiet youngster uninterested in sports. Within a year of his older son’s death, Herman Frye’s business collapsed, and he dissolved it. He then became a commercial salesman, and the family was forced to move several times, eventually settling in Moncton, N.B. There Northrop was raised from age eight and through high school. His real education, however, came from his mother, who managed to keep the family piano and books, even in hard times. She was a firm Methodist, and Frye was well grounded in the Bible; it was she who encouraged him to read widely. His sister paid for piano lessons with, as it happened, an outstanding teacher, organist George Ross, and he remained devoted to music all his life. Frye’s high school record was good but not stellar, in part because he was simply bored. On graduation, he won the prize of free secretarial training and accepted it, calculating that he could always earn money through office work. In fact, he became good enough to be sent to a national typing competition in Toronto in April 1929, where he won second prize in the novice class. In September that year Frye acted on his decision to enter Victoria College at the University of Toronto, counting on his office skills to support him. He enrolled, after a probationary period, in honours English and philosophy, and for the first time found himself in a congenial community where he was accepted and his abilities appreciated. His gratitude was lifelong. Summer jobs and scholarships, as well as strict budgeting, maintained Frye financially during the Great Depression, and he received his ba in 1933. Until the last moment, he doubted that he could afford to return to university for graduate work, but with assistance, he was able to enter Emmanuel, the theological college associated with Victoria, which had been established by the United Church of Canada after the union of Methodists with Congregationalists and many Presbyterians in 1925. He fulfilled his duties as a student minister for the summer of 1934 but soon realized, if he had any doubts, that congregational work was not his true vocation. Some letters show a very unhappy fledgling clergyman indeed. While he liked the people (or a few of them) on his mission field in depression-stricken, drought-ravaged Saskatchewan, he did not like “all these things foisted upon them,” which he described as “trash for the arts, shibboleths and fetishes for religion.” The tribulations with his horse, his only transportation, sound like a Marx Brothers movie. As for windstorms, the “soil wasn’t so bad: it was dodging rocks and chickens and little children and back-houses that got me nervous.” Above all, he desperately missed his fiancée. While still an undergraduate, Frye had fallen deeply in love with a classmate, Helen Kemp. Their letters from the years 1932-39 provide a sharply realized sense of life in the decade for two students, one exceptionally gifted. They show an amorous couple, funny, literate, and impatient with the world. They also deal with worries and problems, chiefly financial. Acute lack of money delayed their marriage, as Frye completed theology and then was ordained in the United Church in 1936. While still at Emmanuel, he took two graduate courses in English, one on William Blake taught by the distinguished scholar Herbert Davis; he knew then where he belonged. Recognizing his talents, Davis suggested two years at Oxford as a quicker way to qualify for university teaching than a phd, and another Victoria College mentor, Oscar Pelham Edgar*, secured financial aid for him. Frye attended Merton College in 1936-37, but he found the University of Oxford disappointing and the long separation from Helen agonizing. His tutor, the poet and scholar Edmund Blunden, proved the wrong kind of instructor for the young Frye. Meanwhile, Helen was pursuing her profession, which also meant separations; talented in the visual arts, she trained at the National Gallery of Canada in Ottawa and the Art Gallery of Toronto, as well as spending time at the Courtauld Institute of Art in London. Twice during their long engagement, she became pregnant, not by intention. The abortion that ended the second pregnancy developed complications, and this while Frye was absent in Oxford. Helen’s mother was her chief support at home. A one-year appointment in English at Victoria College finally allowed the young couple to marry in the summer of 1937. Frye returned to Merton the following year; he graduated as the only first in his subject at the college that year and would eventually receive an Oxford ma. In 1939 he joined the Department of English at Victoria College, arriving with a fat manuscript on Blake under his arm on the day the pact between the Soviet Union and Nazi Germany was signed. He would remain there for the rest of his life. World War II affected both the Fryes, but especially Helen. She gave up her job at the Art Gallery of Toronto in 1941, when priorities at the gallery changed, and found other, less congenial work. But she continued as art editor on the country’s leading left-wing journal, the Canadian Forum (Toronto), where all work was unpaid. Frye had been steadily reviewing there since his graduate-school days, originally at Herbert Davis’s invitation; he served as literary editor in 1947-48 and managing editor from 1948 to 1950 and remained on the board until 1956. Both he and Helen were sympathetic to the Co-operative Commonwealth Federation, the forerunner of the New Democratic Party. Among Frye’s Forum contributions was a review in 1941 of the Charlie Chaplin movie The great dictator, titled “The great Charlie.” In 1944 Helen’s brother, Harold, was killed on a bombing raid over Germany. She took the death hard. At the war’s end, she used her savings as a down payment on the Fryes’ first and only house, in the Moore Park area of Toronto, which they bought complete with a large mortgage. By this time Frye finally felt released enough to rework his Blake material once again. His output had begun slowly, and all his life he would worry about his “inertia,” but as with the lexicographer and critic Samuel Johnson, the worry acted as a spur, and the achievements belie it. Completion of the much-rewritten, unwieldy, and overlong Blake manuscript was delayed by its very originality, by the myriad responsibilities of a beginning teacher, and by other writing, including some attempted fiction. Fortunately, the reader for Princeton University Press, Carlos Baker, recognized its potential and suggested how it might be better shaped, to Frye’s lasting gratitude. The result was Fearful symmetry: a study of William Blake (1947), a rereading of the poet whose early effect on Frye had had the force of a revelation. The book had an immediate and lasting impact. Some reacted to it fervently. “Fearful Symmetry ... ravished my heart away,” American literary critic Harold Bloom later said. “I must have read it a hundred times between 1947 and 1950.” British poet and critic Edith Sitwell admired it greatly, finding in it, in the words of Nicholas Halmi, “an attractive and sustainable understanding of Christianity.” Others, including Kermode, were more detached, chiefly because they found it hard to separate Frye’s voice from Blake’s. The book influenced Blake studies profoundly, even among readers who were not drawn to the main arguments about mythical criticism. Frye rescued Blake’s long prophetic books as poetry, finding a “grammar of symbolism” within them and presenting the author’s thought as a coherent whole. The Fryes’ life after Fearful symmetry changed markedly. He now received regular offers to lecture or teach courses elsewhere, including Harvard University, where he was looked over with a view to being hired. Despite the attraction, he remained in Toronto, feeling at home there. If Fearful symmetry established Frye’s reputation in its field, and occasionally beyond, his masterpiece, Anatomy of criticism: four essays (Princeton, 1957), made him famous. After his work on Blake, he had planned a book on the Renaissance poet Edmund Spenser but found that he could not proceed without re-examining his own critical principles and methods. The result took ten years and much rewriting. He first called the book “Structural poetics,” a title that might have made his subject clearer (the structure of the discipline of poetics) but might also have confused readers by suggesting a link with the structuralists. The French philosopher Paul Ricœur argues persuasively in a 1983 essay that Frye’s work is different in kind from structuralist thought. The latter uses philosophical categories abstracted from the particulars of literary works. Frye’s approach was different. As Ricœur saw, Frye was attempting to set out a typology for literature analogous to the taxonomies that are found in the biological sciences. Frye intended Anatomy of criticism to belong “to the systematic study of the formal causes of art.” Presumably he had in mind Aristotle’s three other causes (the material, the efficient, or agency, and the final, or teleological). He distinguishes four areas of criticism and devotes one essay to each. Preceding the essays is a “Polemical introduction,” and a “Tentative conclusion” follows. The four areas are the historical, the ethical, the archetypal, and the rhetorical. By historical criticism, Frye does not mean explaining literature chiefly as the result of empires, wars, or even social history. Historical criticism here is concerned with the stories of literary works, mapped according to the power of action in the chief character in a work of fiction or in the attitude of the writer in thematic literature. The third essay is centred on mythical patterns of storytelling, distilled from numerous stories in literature. Frye outlines an entire world of apocalyptic, demonic, and analogical imagery. He then turns to four main myths – comedy, romance, tragedy, and irony and satire – and brilliantly analyses their plot variations and character types. He associates the myths with the four seasons: comedy with spring, romance with summer, tragedy with autumn, and irony with winter. While this final essay is the most loosely structured of the four, it contains much suggestive material. Anatomy of criticism is so richly packed that a sentence or two can be expanded into an article or book. Frye did just this when in 1976 he wrote “Charms and riddles,” a fascinating 25-page piece implicit in a few paragraphs from the fourth essay. Throughout his work, Frye was intrigued by the “role of convention in literature.” A convention may be small, like the 14-line structure of a sonnet, or more encompassing, such as the topoi (common themes or formulas) of medieval literature. “When the convention is big enough to include the entire work,” he said in his 1985 Smith lecture, “we call it a genre.” A genre “indicates what the work is, and it suggests the context of the work, by placing it within a number of other works like it.” The sections of any large bookstore indicate how genre works. “I paid some attention to the question of genres” in Anatomy of criticism, Frye added, “because I felt that lack of careful attention in that area made for many confusions and illiterate critical judgments.” Combating such confusions and misjudgements had the force of a quest for him. Some arguments of Anatomy of criticism have proved fruitful for critics. Others have been disputed, quite apart from disagreements with the central premises. A number have engendered radically revised arguments, most prominently by Harold Bloom, who by his own testimony comes “out of Frye” but is a Jewish Gnostic. Some – for example, on metaphor – have still to make their full mark. Frye argued that we should pay attention to exactly how the A and B of metaphor are joined, and he offered five different patterns. But to this day, critics mostly focus on the two main elements of a metaphor, not their ways of being linked. Parts of Frye’s “Polemical introduction” proved controversial, especially when read carelessly. He argued that criticism was neither an exercise in taste nor a direct expression of a personal experience of literature. Criticism treats literary works using a “systematic structure of knowledge” as is the case with the sciences. The critic may help to develop taste and expand experience, but he or she has no business telling readers what to like or dislike. An incommunicable personal experience lies at the centre of criticism, which “comes out of it but cannot be built on it.” Nor do value judgements belong in literary criticism. “Every deliberately constructed hierarchy of values in literature known to me is based on a concealed social, moral, or intellectual analogy.” As the critic grows, it will become clear that some writers are “more rewarding and suggestive to work with” than others. Something was released in Frye by the publication of Anatomy of criticism, for within a few years books began to follow steadily, without hesitation. In these he extended or modified the principles of the Anatomy, working out their implications in more detail, whether in practical and theoretical criticism or for the social realm. His numerous publications fall into two main categories: literary criticism and, equally important for him, social and cultural writing, including much about education. Beyond the two books already discussed, the first category covers collections of essays, as well as studies of individual writers (Shakespeare, Milton, T. S. Eliot) and of literary movements and genres such as Romanticism and romance. The second category consists of reflections on literature and society and on literature and religion. Since his death, some letters, diaries, and working notebooks have been published in The collected works of Northrop Frye, which also conveniently gathers shorter and miscellaneous pieces of writing. The educated imagination (Toronto, 1963), delivered as six radio talks in the Canadian Broadcasting Corporation’s Massey Lectures series the previous year, provides a 68-page introduction to Frye’s thinking about literature and society, and it remains a favourite with readers. Imagination, he posited, gives us a better or worse world than the one we inhabit – two dreams, one of them wish-fulfilment and the other anxiety. He advocated the study in schools of both biblical and classical stories or myths to help us understand the stories and myths offered by political, commercial, and other persuaders. Frye published simultaneously in both literary and social criticism until the end of his life. This twofold vocation is implicit in Anatomy of criticism, where the two spheres are interdependent. “No discussion of beauty can confine itself to the formal relations of the isolated work of art; it must consider, too, the participation of the work of art in the vision of the goal of social effort.” Equally, as he wrote in 1986 in an appreciative review of the deconstructionist Paul de Man, “All dominant ideologies are structures of authority, and, unless they are merely tyrannies enforced by terror, they are aesthetic structures as well.” An ideology usually assumes that it trumps all other views in a given discussion, but aesthetic analysis can shed unexpected light. Frye’s two critical tendencies were recognized early. In 1965 Geoffrey Hartman called them “scientism” and “evangelism.” Frye commented that “scientific” was his own word but perhaps the wrong one. (“What if criticism is a science as well as an art?” he wrote in the Anatomy.) It certainly caused him trouble, though not from anyone who read the full context. The term “evangelism” was not his, but it was the right one, he thought. By “evangelism,” Frye and Hartman simply meant engagement, as distinct from critical detachment, the kind of engagement implicit in the sentence about the discussion of beauty quoted above from Anatomy of criticism. Northrop Frye practised what he preached. He made room for advisory and administrative work: as a long-time member of the Canadian Radio-Television Commission (later the Canadian Radio-television and Telecommunications Commission), as president of the Modern Language Association, as principal of Victoria College between 1959 and 1966, and in many another time-consuming task. He survived in part thanks to the able president of Victoria, Arthur Bruce Barbour Moore, who agreed that Frye’s writing came first. (Frye once commented that “my writing isn’t something I run. It runs me.”) He later confessed that he skimped on some administrative jobs at the college, to say nothing of sleep. “It is curious,” the critic Richard Ellmann wrote, when reviewing The morality of scholarship (Ithaca, 1967), by Frye, Stuart Hampshire, and Conor Cruise O’Brien, “that of all these scholar-teachers only Mr. Frye establishes the rationale of the classroom.” In his writings and interviews Frye emphasized “the fact that there are differences in levels of reading and writing as there are in mathematics between short division and integral calculus.” He maintained that the basics in school “are not bodies of knowledge. They are skills.” Using words, he argued, is a skill that requires teaching and practice, whether we train ourselves or have help. It is fundamental for society, since so much of what we hear in public consists of clichés or “verbal formulas that have no thought behind them.” Therefore the teaching of humanities is “a militant job.” Teachers must engage in “a fight to help the student confront and reject the verbal formulas and stock responses, to convert passive acceptance into active, constructive power. It is a fight against illiteracy and for the maturation of the mental process, for the development of skills which once acquired never become obsolete.” Schools achieve this goal if they stimulate a love of learning, for then students can develop on their own. Frye also saw that most students need to be taught “very carefully and patiently, that there is no such thing as an inarticulate idea waiting to have the right words wrapped around it.... ideas do not exist until they have been incorporated into words. Until that point you don’t know whether you are pregnant or just have gas on the stomach.” He was especially drawn to poetry because good poetry is at the centre of literary experience, the gold standard for our use of words. Frye was himself a renowned classroom teacher, speaking without notes, in a flat, ironic Maritime voice, with an intensity and seriousness about his subject rare even in the university. His witty asides were delivered deadpan. In the late 1950s, after Anatomy of criticism appeared, students travelled some distance (one from Buffalo, N.Y.) to take his weekly graduate seminar. It was in effect a lecture course, partly because of the large size of the class and partly because Frye did not teach through the back-and-forth exchange of a seminar. 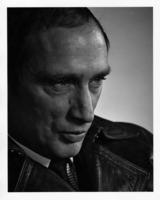 As his literary output continued after 1963, he turned increasingly to the form he found most congenial, the romance. He published A natural perspective: the development of Shakespearean comedy and romance (New York) in 1965, and his public lectures as the Charles Eliot Norton Professor of Poetry at Harvard for 1974-75 are titled The secular scripture: a study of the structure of romance (Cambridge, Mass., 1976). Once more, a briefly stated insight in Anatomy of Criticism had grown and blossomed. The return of Eden: five essays on Milton’s epics (Toronto, 1965) analyses the cyclic movement in Paradise lost and Paradise regained; an exploration of Shakespearean tragedy followed two years later. While these subjects can readily be linked to Anatomy of criticism, some of Frye’s essays, notably in The stubborn structure, reveal his surprising scope. “Dickens and the comedy of humours” treats a novelist, not a poet, and “The problem of spiritual authority in the nineteenth century” shows how astute he could be about thinkers such as Thomas Carlyle, John Stuart Mill, John Henry Newman, and Matthew Arnold. Although he could have moved to virtually any university he chose after 1957, Frye remained based in Canada. “I found, as I grew older, that my roots were going deeper and deeper into the Canadian society and that I couldn’t really pull out of that.” Both religious and political roots - his United Church affiliation and his CCF-NDP sympathies - were uniquely Canadian. From the start of his career he paid attention to Canadian cultural activities, as is clear from the 741-page collection Northrop Frye on Canada, published posthumously in Toronto in 2003. 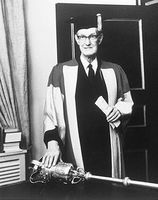 Frye had been asked in 1950 to take responsibility for the University of Toronto Quarterly’s annual review of Canadian poetry in English, and he did so for ten years. In 1971 he assembled these reviews, along with nine essays, in The bush garden. His reviews are sympathetic to serious work and impatient with sloppy poems. While they were influential, other pieces in the volume garnered more attention. His emphasis on the terror of the Canadian wild was much disputed, and his phrase “garrison mentality” gained wide notoriety, sometimes outside its historical context, since Frye analyses both the advantages and the disadvantages of such an outlook. Perhaps best known is his reframing of the question of Canadian identity: “It is less perplexed by the question ‘Who am I?’ than by some such riddle as ‘Where is here?’” The paradox is telling and goes on generating discussion. As a student going to the University of Toronto, I would take the train to Montreal, sitting up overnight in the coach, and looking forward to the moment in the early morning when the train came into Levis, on the south side of the St. Lawrence, and the great fortress of Quebec loomed out of the bleak dawn mists.... Here was one of the imaginative and emotional centres of my own country and my own people, yet a people with whom I found it difficult to identify, what was different being not so much language as a cultural memory. But the effort of making the identification was crucial: it helped me to see that a sense of unity is the opposite of a sense of uniformity. Uniformity, where everyone "belongs," uses the same clichés, thinks alike and behaves alike, produces a society which seems comfortable at first but is totally lacking in human dignity. Real unity tolerates dissent and rejoices in variety of outlook and tradition. Earlier in the preface to The bush garden he had observed: “The tension between this political sense of unity and the imaginative sense of locality is the essence of whatever the word ‘Canadian’ means. Once the tension is given up, and the two elements of unity and identity are confused or assimilated to each other, we get the two endemic diseases of Canadian life. Assimilating identity to unity produces the empty gestures of cultural nationalism; assimilating unity to identity produces the kind of provincial isolation which is now called separatism.” The bush garden was published a year after the October crisis [see Pierre Elliott Trudeau]. 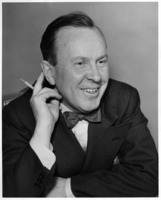 From 1968, when Prime Minister Lester Bowles Pearson* appointed him to the Canadian Radio-Television Commission, until he left in 1977, Frye worked hard in all areas of the commission’s mandate to regulate broadcasting in Canada. Its first chair, Pierre Juneau, especially valued him in a research capacity; he could also make lucid judgements and produce reports on everyday matters with astonishing rapidity. Little did some of those who appeared before the commission know what they were facing. The anecdote is still told about an executive who showed off his classical learning by quoting the Roman orator Junius; Frye observed drily that Junius was the pen name of an 18th-century Englishman. Frye’s biblical books yoke the Bible and literature (they do not, he stressed, consider the Bible as literature). Thus the first part of The great code treats the “order of words,” while the second presents the “order of types.” In a biblical context, “type” is a weighted word, signifying events, persons, and items in the Hebrew scriptures that find their antitypes or fulfilment in the New Testament. Biblical typology, as it had evolved, was highly schematic, which suited Frye’s temperament. Knowledge of typology is certainly necessary in order to read much older literature, as well as to interpret paintings from the past and some great stained-glass windows. His desire was to make typology pertinent for the modern world by turning it into living symbol and internalizing it, much as Blake had done. His strategy is even more apparent in Words with power, which is also divided into two parts. The first treats literary matters, notably levels of reading. The second, “Variations on a theme,” discusses four variations: the mountain, the garden, the cave, and the furnace. 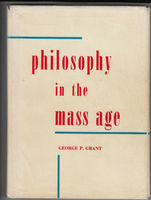 Frye describes these chapters as “a series of essays on comparative mythology, organized around four primary concerns: the concern to make and create, the concern to love, the concern to sustain oneself and assimilate the environment,... and the concern to escape from slavery and restraint. Each essay relates these concerns to the Bible and to various themes in literature.” His last book, The double vision: language and meaning in religion (Toronto, 1991), published posthumously, acts as a coda to the two biblical works. Response to the books was appreciative, especially from those who were already sympathetic to Frye’s outlook and those who knew little of the subject. Others were less enthusiastic. It is, of course, the Christian Bible that is his focus, and some Jewish critics, whose Bible consists of the Hebrew Scriptures, found him less congenial, especially when Frye dealt with biblical typology. The Canadian poet and critic Eli Mandel asked, “Whose tradition?” and disliked the tone of kerygma, though he generously appreciated the full achievement. The biblical scholar Robert Alter provided a cogent and telling disagreement with Frye in 2004, working from a more orthodox Jewish perspective. Frye’s Blakean outlook also differs from the traditional Christian one, as several critics have noted. Despite his enormous influence, Frye remained a shy man; it was as if he was holding back the force of his great intellectual and emotional energy. He was also a formidable ironist. His wit, both written and verbal, was proverbial. He delighted in music all his life, playing the piano, collecting and studying scores, and writing about music from his intimate knowledge of the subject. A man of extraordinary gifts, he was simple in his affections - for friends and colleagues as for his college. There he was a familiar figure, coming regularly to lunch (where he invariably ate ice cream for dessert) and treating the college rather as an extended family. He continued to be a committed undergraduate teacher all his life, as well as a remarkable public speaker. In the mid 1970s Helen Frye had sought advice from a psychiatrist about her increasing insomnia and anxiety. She was well enough to move to Cambridge, Mass., when her husband taught at Harvard in 1974-75, but by 1979 her humorous, intelligent, capable self was changing. She became more forgetful and sometimes resentful, and she stopped enjoying travel as she had for years. A diagnosis confirmed Alzheimer’s disease, and Frye began to accommodate the household and his schedule to her condition. In 1986 he planned a trip in Australia with Helen which would give her a holiday and himself a break after a month’s lecturing in Sydney and elsewhere. Jane Widdicombe, his long-time secretary and now like a daughter to him, and her husband accompanied them. In Cairns, Helen was suddenly hospitalized with an embolism in the lungs, and she died a few days later. The shock to Frye was enormous. He became depressed, withdrew from social contact much more than usual, and seemed a shadow of his old self. Among those who alleviated his solitude were members of the class of 1933, with whom he and Helen had kept in touch over the years. One of these was Elizabeth Eedy Brown, now widowed. She and Frye had always been good friends, and they grew closer. They decided to marry in July 1988, and the change in Frye was immediate and reassuring. Frye’s honours over the years were many. The University of Toronto appointed him its first university professor in 1967. He was made a companion of the Order of Canada in 1972, and between 1969 and 1981 he became an honorary fellow or member of the American Academy of Arts and Sciences, Merton College, Oxford, the British Academy, the American Philosophical Society, and the American Academy and Institute of Arts and Letters. Elected to the Royal Society of Canada in 1951, he received the society’s Lorne Pierce Medal in 1958 and its Pierre Chauveau Medal in 1970. He was the recipient of the Molson Prize of the Canada Council for the Arts in 1970, the Royal Bank Award for Canadian Achievement in 1978, the Governor General’s Award in non-fiction for 1986, and a Toronto Arts Award for lifetime achievement in 1987. He also held more than 30 honorary doctorates from universities and colleges around the world. He was appointed chancellor of Victoria in 1978, a position he held until his death. Northrop Frye possessed one of the great analytic minds of his time. Even more markedly, he possessed an outstanding syncretic mind. He was Aristotelian in his delight in anatomy, understanding well that taxonomies are theories of order and not pigeonholes, and that all typologies and taxonomies are interpretive, a point emphasized by the biologist Stephen Jay Gould. Frye has been called Platonic in his sense of the visionary, though he was more precisely biblical, in the way that Blake was biblical – that is, he focused, not on theology or the scholar’s knowledge of the Bible, but on its mythic force. His combination of taxonomy and the visionary was congenial to the 19th century, and he may have been one of the last great thinkers in a learned, liberal tradition with roots in that era. Asked to sum up his views, Frye would say that the works of literature make up a “total order of words” and not simply an aggregate. If literature is simply an aggregate, where one work follows another, then some other order of things (historical, psychological, political, religious, philosophical) provides the framework or story inside which we place works of art, as well as the stories of our own lives. A writer does not function in this way, however, and critics cannot provide helpful patterns for reading literature without knowing in their bones the principles and history of a given art. Frye’s move beyond this knowledge towards a “total order of words” akin to Blake’s or the poet Stéphane Mallarmé’s proved more controversial. But while critics argue about the implications of a “total order of words” or even an ideal order, there is no disagreement that criticism needs to keep its terms and its taxonomies clear, or that much public discussion of writing displays a distressingly low command of rhetoric. In 1990 Frye ended an appreciative response to the American Society for Eighteenth-Century Studies as follows: “The way I begin a book is to write detached aphorisms in a notebook, and ninety-five percent of the work I do in completing a book is to fit these detached aphorisms together into a continuous narrative line.... it is possible that many of my readers tend to find their way back to the original aphoristic form, finding me more useful for detached insights than for total structures.” Some readers are drawn to Frye’s entire patterning of a verbal universe. Others, as he well knew, prefer different, larger patterns or more tentative or even fractured ones, but continually find his work full of useful insights. In addition to the works mentioned in the text, Herman Northrop Frye’s major publications include Fools of time: studies in Shakespearean tragedy (Toronto, 1967); The modern century (Toronto, 1967); A study of English Romanticism (New York, 1968); The critical path: an essay on the social context of literary criticism (Bloomington, Ind., 1971); The myth of deliverance: reflections on Shakespeare’s problem comedies (Toronto, 1983); and Myth and metaphor: selected essays, 1974-88, ed. R. D. Denham (Charlottesville, Va, 1990). His ideas about education were expressed in “Don’t you think it’s time to start thinking?,” Toronto Star, 25 Jan. 1986: M2 and his review of Paul de Man’s The rhetoric of Romanticism appeared in “In the earth, or in the air?,” Times Literary Supplement (New York), 17 Jan. 1986: 51. A comprehensive list of Frye’s published work can be found in R. D. Denham, Northrop Frye: a bibliography of his published writings, 1931-2004 (Emory, Va, 2004). Since his death, Frye’s published and unpublished writings have been assembled in Collected works of Northrop Frye, gen. ed. J. M. Robson and A. A. Lee (27v. to date, Toronto, 1996- ). Volumes from this series of particular importance for this study were The correspondence of Northrop Frye and Helen Kemp, 1932-1939, ed. R. D. Denham (2v., 1996); Northrop Frye’s late notebooks, 1982-1990: architecture of the spiritual world, ed. R. D. Denham (2v., 2000); The diaries of Northrop Frye, 1942-1955, ed. R. D. Denham (2001); and Northrop Frye on Canada, ed. Jean O’Grady and David Staines (2003). Most manuscript material is held in the Northrop Frye fonds, Victoria Univ., in the Univ. of Toronto, the finding aid for which is now online: Victoria Univ. Library, “Guide to the Northrop Frye papers”: http://library.vicu.utoronto.ca/special/F11fryefonds.htm (consulted 4 Dec. 2008). “Northrop Frye (1912-1991): About the collection-Related resources”: http://library.vicu.utoronto.ca/special/F11fryeintro.htm (consulted 4 Dec. 2008) provides a link to a list of about two thousand books annotated by Frye. The author has in her possession extensive files containing clippings, course notes, and teaching materials. Criticism in society, ed. Imre Salusinszky (New York, 1987), 26-42, contains interviews with Frye, Bloom, Kermode, and others. Several works by Frye have been translated into French. In chronological order, they are: Le Siècle de l’innovation: essai [translation of The modern century], trans. François Rinfret (Montréal, 1968); Anatomie de la critique [translation of Anatomy of criticism: four essays], trans. Guy Durand ([Paris], 1969); Pouvoirs de l’imagination: essai [translation of The educated imagination], trans. Jean Simard (Montréal, 1969); Le Grand Code: la Bible et la littérature [translation of The great code: the Bible and literature], trans. Catherine Malamoud (Paris, 1984); La Parole souveraine: la Bible et la littérature II [translation of Words with power: being a second study of “the Bible and literature”], trans. Catherine Malamoud (Paris, 1994); L’Écriture profane: essai sur la structure du romanesque [translation of The secular scripture: a study of the structure of romance], trans. Cornelius Crowley ([Belfort, France], 1998); Les Fous du temps: sur les tragédies de Shakespeare [translation of Fools of time: studies in Shakespearean tragedy], trans. Jean Mouchard ([Paris], 2002); Une perspective naturelle: sur les comédies romanesques de Shakespeare [translation of A natural perspective: the development of Shakespearean comedy and romance], trans. Simone Chambon and Anne Wicke ([Paris], 2002). Margaret Atwood, “The great communicator,” Globe and Mail (Toronto), 24 Jan. 1991: C1. Louise Brown and Bill Schiller, “‘Key to education’ is love of learning,” Toronto Star, 10 May 1987: A1. New York Times, 25 Jan. 1991. Robert Alter, “Northrop Frye between archetype and typology,” in Frye and the Word: religious contexts in the writings of Northrop Frye, ed. Jeffery Donaldson and Alan Mendelson (Toronto, 2004), 137-50. John Ayre, Northrop Frye: a biography (Toronto, 1989). Harold Bloom, “Northrop Frye in retrospect,” in Northrop Frye, Anatomy of criticism: four essays (Princeton, N.J., 2000), vii-xi. R. D. Denham, Northrop Frye: an annotated bibliography of primary and secondary sources (Toronto, 1987). Eighteenth-Century Studies (Baltimore, Md), 24 (1990-91), Special issue (Northrop Frye and Eighteenth-Century Studies). Richard Ellmann, “Dissent and the Academy,” [rev. of The morality of scholarship, ed. Max Black], New York Review of Books (New York), 15 Feb. 1968: 8. Nicholas Halmi, “Northrop Frye’s Fearful symmetry,” Essays in Criticism (Oxford, Eng. ), 55 (2005): 159-72. A. C. Hamilton, Northrop Frye: anatomy of his criticism (Toronto, 1990). Jay Macpherson, The boatman (Toronto, 1957). Eli Mandel, “Frye: the Bible and literature – tautology as truth and vision,” in Eli Mandel, The family romance (Winnipeg, 1986), 135-40. Northrop Frye in conversation, ed. David Cayley (Toronto, 1992). Northrop Frye in modern criticism: selected papers from the English Institute, ed. and intro. Murray Krieger (New York, 1966). Paul Ricœur, “‘Anatomy of criticism’ or the order of paradigms,” in Centre and labyrinth: essays in honour of Northrop Frye, ed. Eleanor Cook et al. (Toronto, 1983), 1-13. A world in a grain of sand: twenty-two interviews with Northrop Frye, ed. R. D. Denham (New York, 1991). Eleanor Cook, “FRYE, HERMAN NORTHROP,” in Dictionary of Canadian Biography, vol. 22, University of Toronto/Université Laval, 2003–, accessed April 20, 2019, http://www.biographi.ca/en/bio/frye_herman_northrop_22E.html.